Astigmatism is a condition of the eye that causes blurred vision due to a difference in the curvatures of the eye. Astigmatism tends to blur your vision at all distances. It is often present in childhood and usually occurs with nearsightedness or farsightedness. 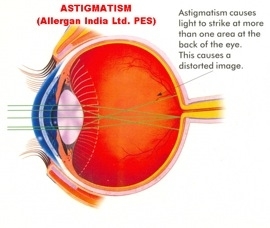 Astigmatism can be corneal or lenticular. Corneal astigmatism occurs when the front surface of your eye (cornea) has a different curvature in one direction. Lenticular astigmatism is a result of a difference in curvature in the lens. The common comparison is to that of a basketball and football. The basketball has an equal curvature whereas a football has a difference between the surface curves creating the oblong shape. In either type of astigmatism, corrective lenses are designed to create a clear focus based on the different curves measured. This can be accomplished for most patients with standard eyeglasses and contact lenses. 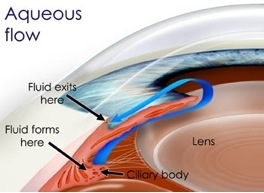 A cataract is defined as any loss of clarity in the crystalline lens of the eye. It is typically an age-related change that occurs during the fifth, sixth, or seventh decade of life. Trauma can cause the development of cataracts in younger individuals. Symptoms include a foggy quality to vision, poor night vision, and a gradual loss of distinct vision. 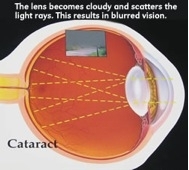 While changes in eyeglass or contact lens corrections can sometimes improve the quality of vision for an individual with a cataract, the primary means of correction is through surgery to remove the clouded lens. Diabetes is a condition in which the body does not process sugar properly, allowing unusually high amounts to build up in the bloodstream and damage blood vessels throughout the body. The small blood vessels in the eyes, kidneys and feet are particularly at risk for damage from diabetes. Once damaged, the blood vessels of the eye can leak blood and protein into the retina, which is the thin tissue which captures images and carries them to the brain. This is known as diabetic retinopathy. In the worst cases of diabetic retinopathy, new abnormal blood vessels can grow inside the eye and potentially lead to blindness. Tight daily control of blood sugar and regular check-ups with the medical doctor are important steps in preventing or slowing diabetic damage to the eye. The doctor may recommend diet changes, weight loss, medication or a combination of these things to maintain a healthy blood sugar throughout the day. Patients with early diabetic damage to their eyes are often not aware of these changes and do not see or feel any differently. Later, as the damage worsens, patients may notice blur, distortion or loss of vision. Damage to the eyes can usually be treated if found early enough, so it is important that all patients with diabetes have a dilated eye exam at least once per year regardless of how clear their vision may seem. Dry Eye Syndrome affects many adults and is a common complaint addressed during eye examinations. This condition is characterized by insufficient or poor quality tears. Tears play an important role in lubricating and nourishing the surface of the eye. When there is a problem with the tears, symptoms of discomfort can develop and signs of dry eye can be observed by your doctor. Discomfort or intolerance to contact lens wear. There are many underlying causes of dry eye. There may be problems with the production of tears or increased evaporation of tears from the eye surface. Normal aging changes and hormonal changes can add to the symptoms of dry eye. Certain medications and systemic diseases are also associated with dry eye. The treatment of dry eye may include a number of options. Your doctor will decide which is best for you. Some common dry eye treatments are listed below. If you are experiencing any of the symptoms of dry eye, please let your doctor know. If you suffer from advanced dry eye, you may benefit from a consultation through the TearWell: Advanced Dry Eye Treatment Center. Visit our TearWell site to learn more. With early treatment, you can often protect your eyes against serious vision loss. Information regarding the symptoms of glaucoma, diagnosing glaucoma and its treatment can be found below. The Glaucoma Foundation is the premier not-for-profit organization committed to leading the fight against glaucoma and to identifying new treatments and cures. Hyperopia (or farsightedness) is a condition where the eye is shorter than normal or the front surface of the eye (cornea) is flatter than normal. 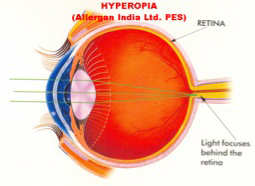 When a hyperopic patient looks at an object, the image of that object focuses behind the eye. This means the patient can see clearly in the distance but vision is blurry at near. 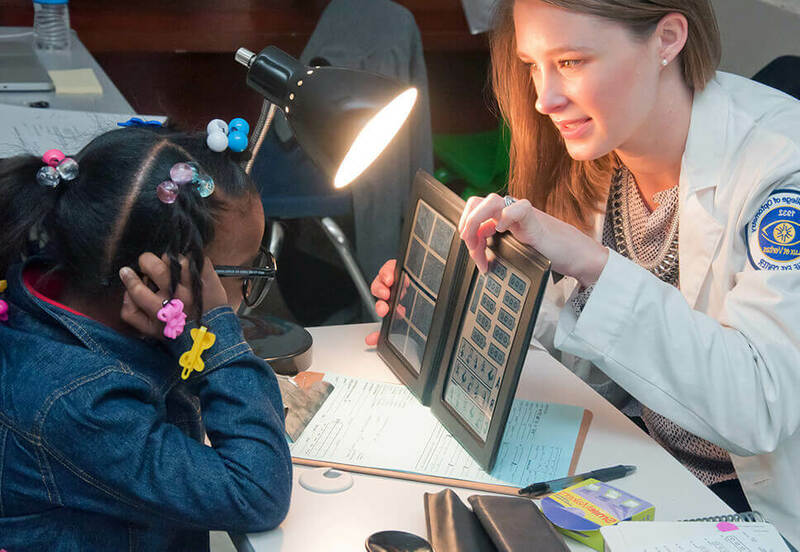 Some people, particularly younger patients, are able to use their natural focusing abilities (accommodation) to move the image to the back of the eye while other patients require eyeglasses or contact lenses to correct their vision. 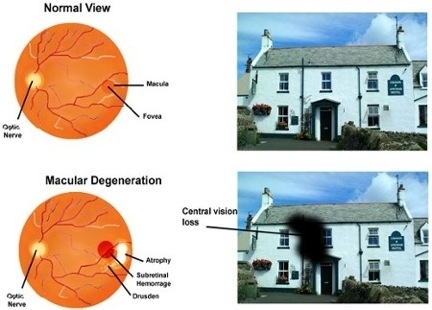 Macular degeneration is a condition which affects the central vision and is typically seen in people 60 years or older. There are two different types of macular degeneration: dry and wet. 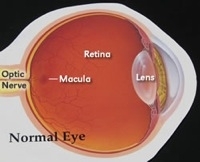 In dry macular degeneration, deposits of fat and protein develop in the center part of the retina, or macula. The macula is the area of tissue that captures all the images we look directly at, such as when reading or looking at a person face. When small, these deposits may have no effect on the patient’s vision. As the deposits get larger, patients may notice their central vision is wavy or small parts may be missing. Dry macular degeneration is the more common type, progresses more slowly and early on, and causes fewer changes to vision. Wet macular degeneration typically causes more severe changes to the central vision and can progress very quickly. 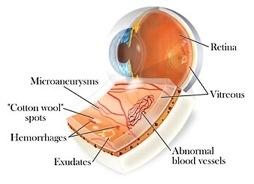 This is because in addition to macular deposits, patients with wet macular degeneration also have new abnormal blood vessels that develop beneath the macula. These new blood vessels are very weak and frequently leak blood or fluid. Regular dilated eye exams every 6 months to one year are an important part of managing macular degeneration. Patients with wet or dry macular degeneration may also be given a home Amsler grid to monitor their central vision between eye exams. This grid is a series of lines which the patient looks directly at to see if there have been any vision changes such as wavy spots or areas where their vision is missing. 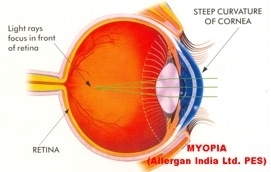 Myopia or near-sightedness is a condition where images focus in front of the retina. The condition typically results from either increased curvature on the front surface of the eye (the cornea) or increased overall length of the eyeball. Symptoms are blurred vision primarily in the distance. 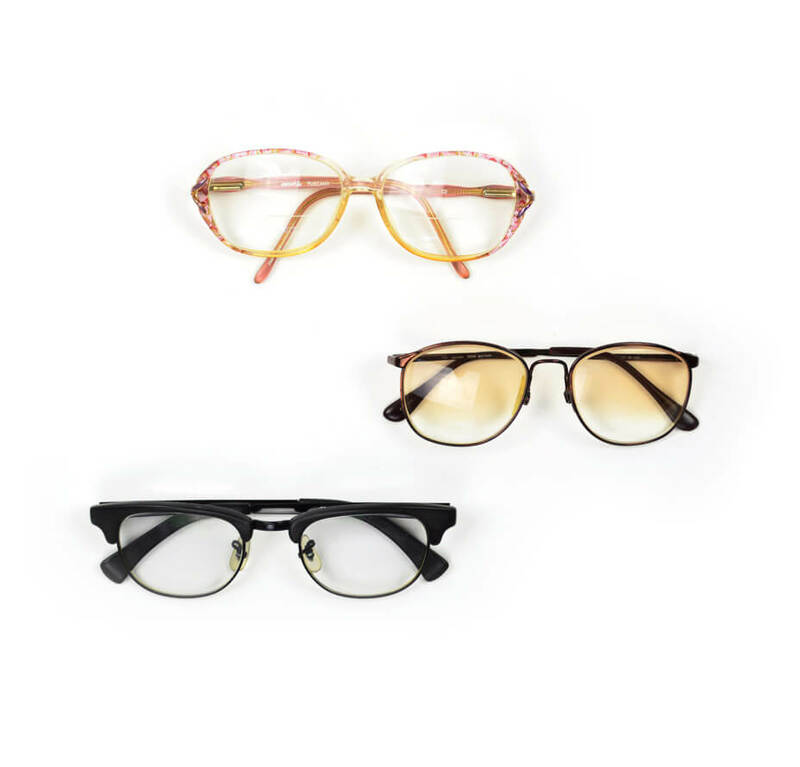 Correction is usually through the use of eyeglasses or contact lenses. Surgical corrections can also be made to reduce or eliminate the amount of myopia for many individuals. Presbyopia is a condition where the crystalline lens of the eye loses its youthful flexibility. This change results in greater difficulty in focusing and seeing smaller print at near reading distances. The condition typically becomes noticed during the mid- to early forties and is usually compensated for through the use of reading glasses or bifocal lenses.